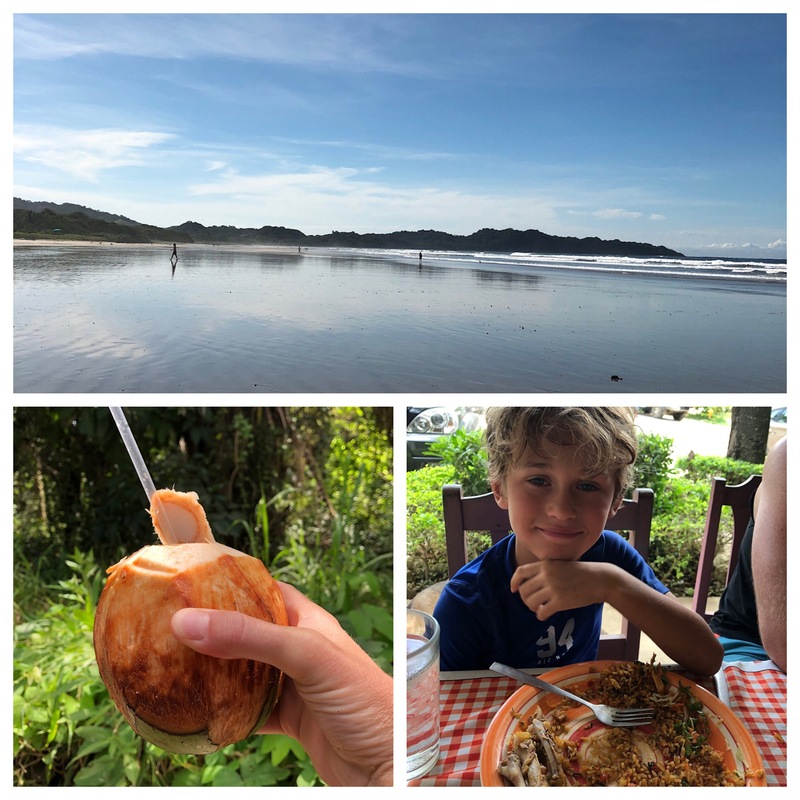 Its taken me a lot longer than anticipated to write up this post about our two weeks in Costa Rica. But, its finally here! 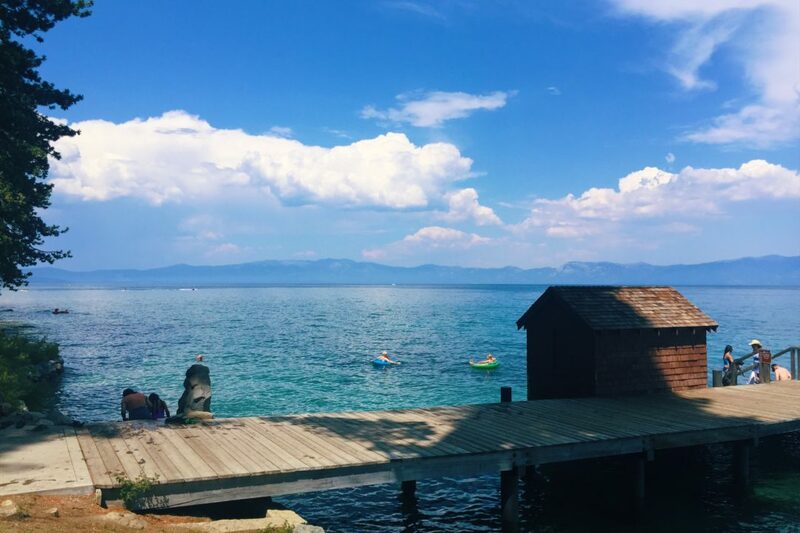 My plan for this post is to share the highlights of our trip — what worked, what didn’t, and our favorite spots. 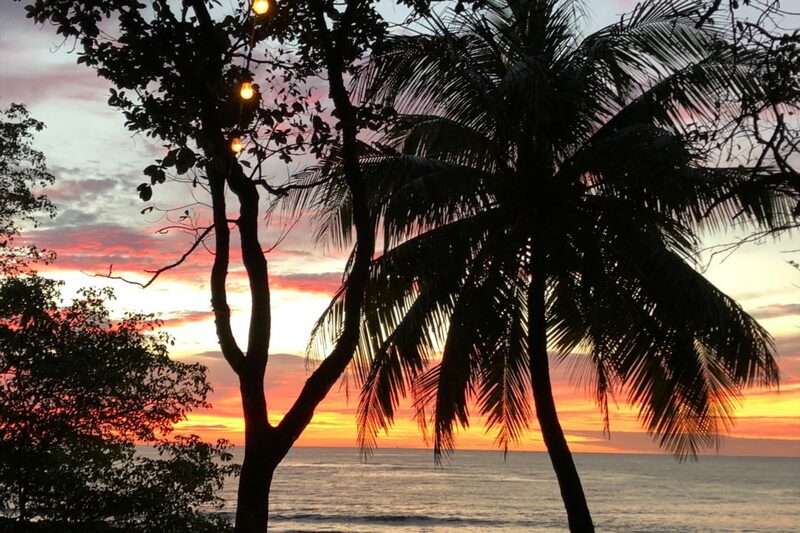 Before you go to Costa Rica, I recommend that you read this post I wrote about what to know about Costa Rica before you go. First off — the WHERE: We flew in from LAX to the Capital City of San Jose (there is a direct flight on Alaska in case anyone is interested). In the last few years Costa Rica has definitely updated their airport and now its a breeze getting through customs. The only issue that I still see is the crazy maze of traffic around the airport. It can be seriously confusing if you plan to rent a car so be warned and definitely plan on having navigation. For more information about rental cars and the crazy laws and fees – read this. From San Jose we drove about four hours to the Pacific Coast side of the country and stayed in Playa Dominical (I’m including a map below). 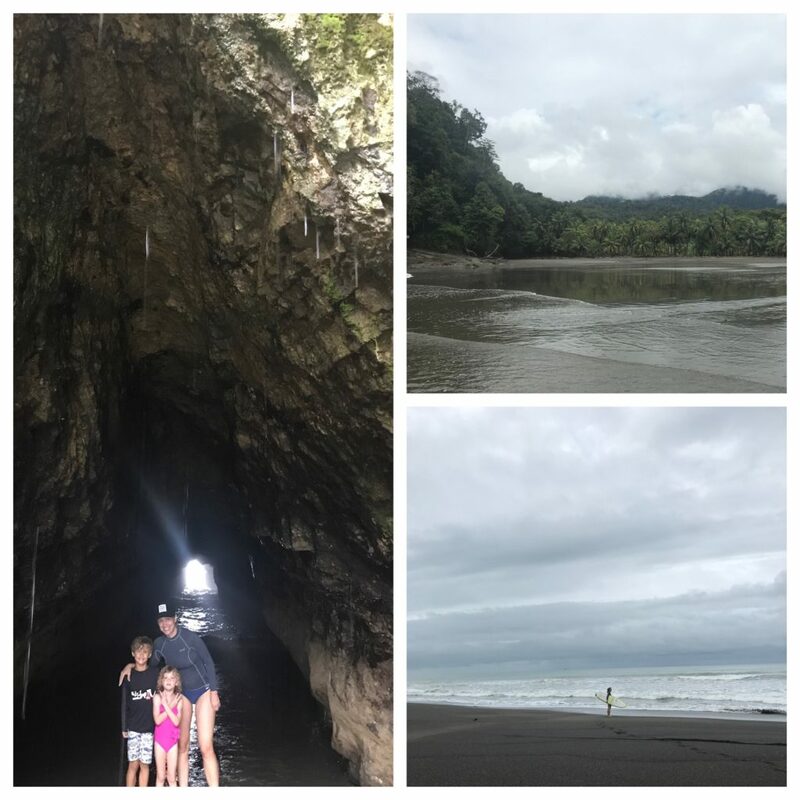 We stayed in Dominical for three nights and then drove about an hour north to Manuel Antonio. There, we stayed for five days before driving a seriously long and bumpy road all the way north to Playa Guiones, which is about two hours south of Tamarindo. We stayed on the Pacific side of the country this trip. Getting to Dominical — if you drive from San Jose you will have to drive over a bridge called the Rio Tarcoles near Jaco. Stop! 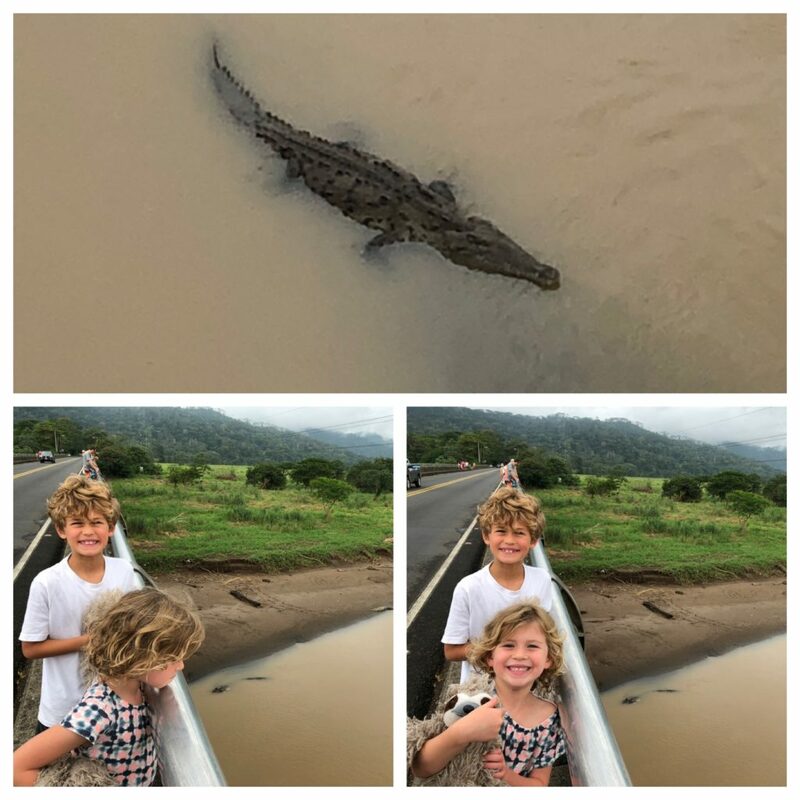 Get out and check out the crocodiles lounging below – they are HUGE! The first time I visited Dominical was in 2006. It was a sleepy surf town with dirt roads and jungle everywhere. I was expecting it to be very different, but surprisingly its still pretty sleepy and small. The roads are still bumpy, potholed and unpaved. The main changes I noticed were more restaurants including a really great brewery. It was raining like crazy most of the time we were there, so we were jumping over puddles and covered in mud, but we didn’t mind. If you like jungle Dominical is the place for you. We definitely needed an SUV with 4 wheel drive for this part of the trip. Dominical has dark sand beaches that go for miles (it gets super hot when its warm out so wear sandals on the sand!). It’s hard to see the beaches from the highway so you will have to cut through jungle paths to get to the beach. Phat Noodle – The is a new restaurant that popped up since we were last in Dominical. This noodle and Thai inspired spot serves food out of a parked airstream type trailer. There are outside picnic benches that are covered. The food was good (not awesome) but totally good and healthy. Portions are pretty small. Prices are similar to what it would be in the U.S.
Fuego Brew Co- Fuego Brew Co. is a great spot. The restaurant is built up high so you feel like you are up in a treehouse. This craft brewery brews some solid beers. The food was good as well – I had the falafel and cucumber salad and my husband and kids had tacos. It’s a great place to relax after a day of surfing. Especially if you are a beer lover. Again, no bargain on pricing, but everything we tried was good. Uvita de Osa is a small village south of Dominical. Its the closest village to Marino Ballena National Park. It has the closest larger grocery store – and some solid eating spots and coffee shops. Restaurante y Pizzeria La Fogata – We really enjoyed this pizza place primarily because of the jungle views and the honey they provide for your pineapple pizza. Who knew honey on pizza was a thing? They also have some bottled craft beers. The restaurant is pretty close to the national park if you plan to go there and walk around. Surfing — There are surf spots all along the coastline. We found Dominical to be a pretty tough beginner wave. Many recommended Dominicalito which we visited at low tide and thought was really beautiful. If you need to rent a board there are a few good shops in Dominical with lots of options from longboards to short boards. Playa Ventanas — Playa Ventanas is one of my favorite places in Costa Rica (see photos above). Its about a 10 minute drive from Dominical. When you get down to the beach you will have to pay a small parking fee so have some Colones on you. The beach is beautiful and covered with little hermit crabs. One of the best parts about the beach are the caves. On a low tide you can walk nearly all the way through to the ocean beyond. My kids thought they were pirate caves. Surfing is pretty mellow here, and its a great spot for spending a whole day relaxing. It really feels like you are on some deserted island (at least during the wet season) when we were the only ones there. But it can get crowded at other times of the year. This small national park goes out to an outcropping of what looks like a Whale’s Tail. We went for a walk along the beach- the weather wasn’t great, but when its not rainy season this park is good for snorkeling, whale watching and relaxing. I am super bummed we didn’t get to go to these waterfalls, they were just about 30 minutes from Dominical – but it was raining so hard that we couldn’t make it. I have heard great things about it though. For more information go here. 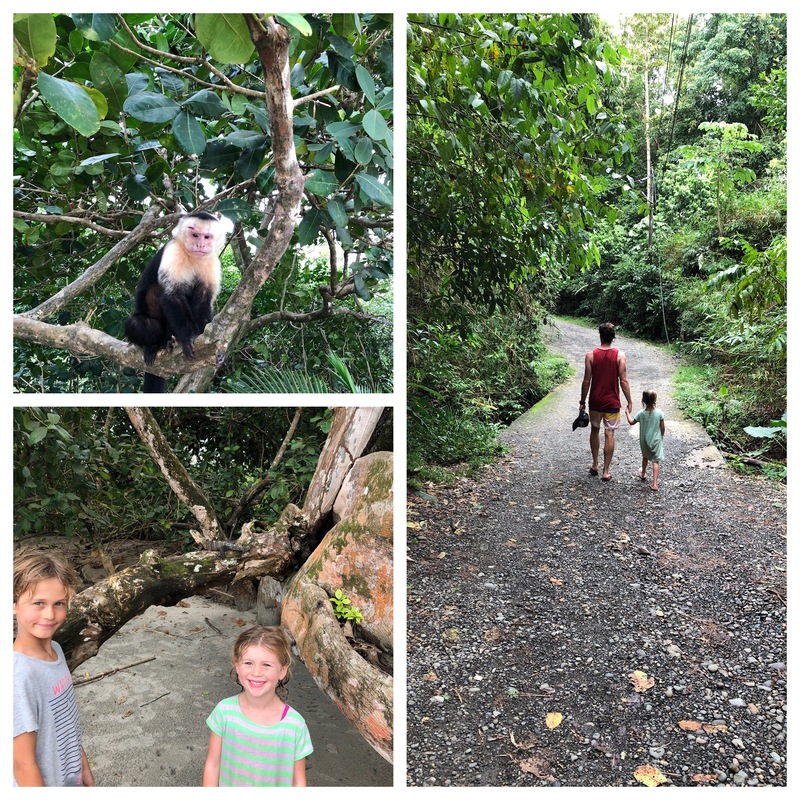 Manuel Antonio was our favorite stop of our trip to Costa Rica (we even added a few extra nights that we weren’t planning on). Having seen a lot of the country now (I spent a month in 2006 in Costa Rica), Manuel Antonio is really special. The town is set high above the ocean and the views from nearly everywhere you go are spectacular. We stayed in a little studio AirBnB for around 100$ a night – our patio view was incredible. We could walk to restaurants and beaches, and sloths, monkeys, Scarlett Macaws and more were literally outside our apartment. 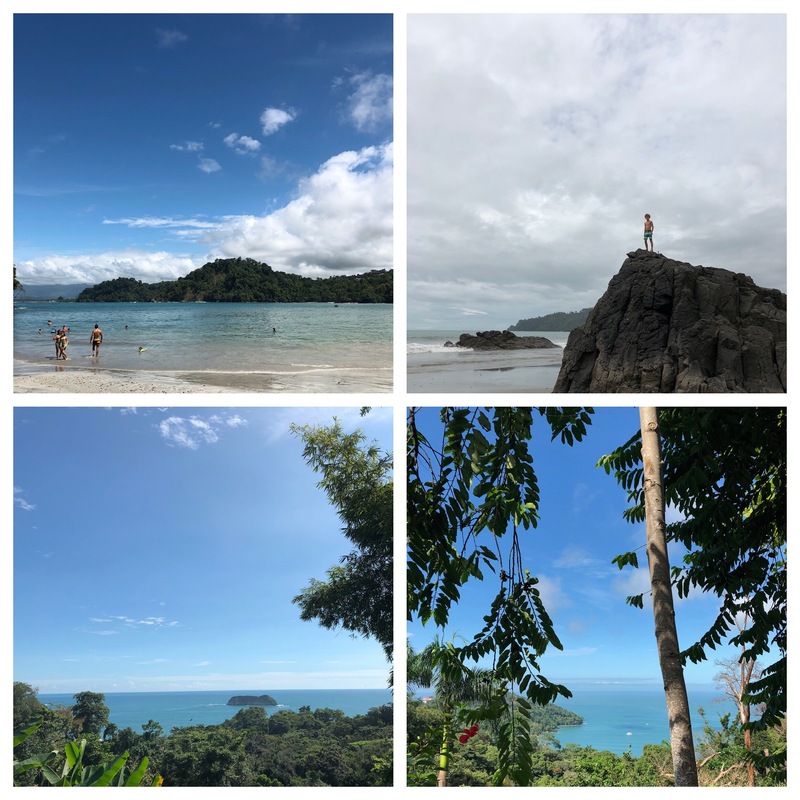 There are so many wonderful things about Manuel Antonio I could (and probably should) do a separate in-depth post on it. So first off, Manuel Antonio is expensive. The food, the small grocery stores that cater to tourists are all comparable or higher than U.S. prices. If you want to eat for less you will need to try some of the local Tico places (rice, beans etc) in the nearby town of Quepos (where more locals live). Our strategy was to cook breakfast and lunch in our AirBnB and enjoy a nice dinner every night out and watch the sunset from the incredible views from nearly every restaurant. We had some great fish, some amazing (for Costa Rica) pizza while we were there. Barba Roja- This restaurant that serves a wide range of foods like fish, burgers, tacos etc. looks kind of cheesy from the outside with its pirate themed sign. But the food is really great – we got the fresh caught fish of the day (two different nights), and the view is spectacular. The burger is really good too. Its pricey so expect American prices. La Lambretta Pizzaria- This was the best pizza we had in Costa Rica. The wait staff was really great, and friendly helping my kids with their Spanish. This restaurant also has a great view. El Avion- If you visit Manuel Antonio National Park you will drive by El Avion. You can’t miss the huge airplane that was permanently parked at the restaurant that is now open for cocktails and lots of selfies. The food was pretty meh, but the fun of the location makes it a fun spot to visit. Sancho’s Tacos – Great tacos, loud music, pretty good prices. This restaurant also has several TVs for watching sports. It was the world series when we were in Costa Rica, so we enjoyed watching the game with some tacos and beers. There’s no doubt that Costa Rica is a surfer’s paradise. Manuel Antonio has some great beaches for surfing. 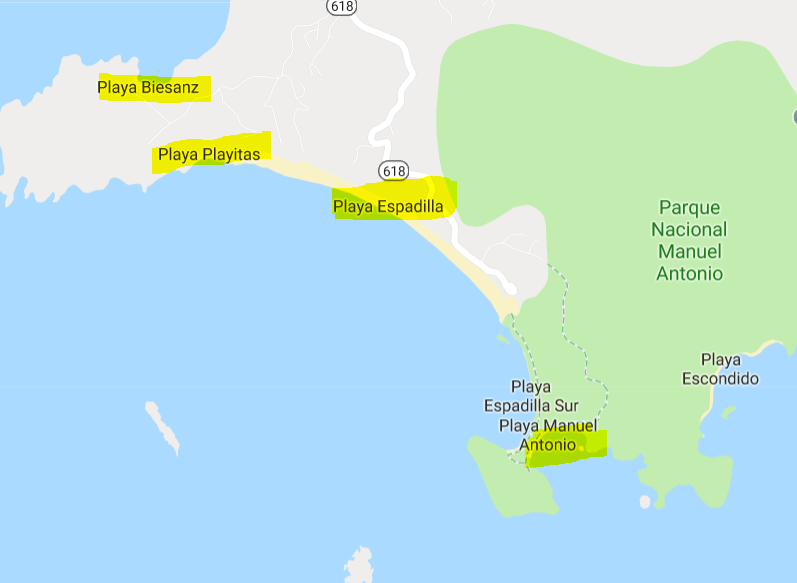 My husband in particular liked the break at Playa Playitas and the South end called Play Espadilla is better for longboarding and beginners. I included a highlighted map below in the beaches section. The beaches are so beautiful. We visited four different ones when we were in Manuel. Some are more geared toward surfing (as mentioned above). Playa Biesanz is more of a swimming beach and its one of the most beautiful beaches I’ve been to. Its tucked in a cove and my kids hung out and body surfed in the very mellow waves that rolled in. The water is such a pretty blue. I want to be there right now! You have to hike down a short trail to get there. The other beach that was incredible was Playa Manuel Antonio. You can only get there by walking through the national park. Its also in a protected cove and the clear water and mellow waves make for some seriously amazing swimming. Just watch out for the raccoons who are nearly tame and try and steal things out of your bags while you’re in the water! This small park is packed with animals! From sloths to three different kinds of monkeys to bats, crabs, iguanas and lizards, even raccoons its like visiting a zoo in the wild. Though you can simply walk through yourself and find lots of animals, many people pay a guide to take them around. We didn’t but I kind of wish we had. The guides know where the sloths sleep, they also have telescopes that allow you to see animals way up in the canopy. One of the best things about this park is the beach at the end of the trail. You walk down a hill and this gorgeous bay awaits. Its perfect for swimming and if we go back I’ll definitely pack a lunch and plan on staying there all day next time. The best!! There is ziplining all over Costa Rica so you really can go pretty much everywhere in the country. This time we went with the company Safari Adventures (they were SO great). They picked us up from our AirBnB and drove us up into the mountains. Some people did a tour where they four wheeled across the river and then ziplined. We had to take a four wheel across the river to get to the ziplines area and it was SOO fun. 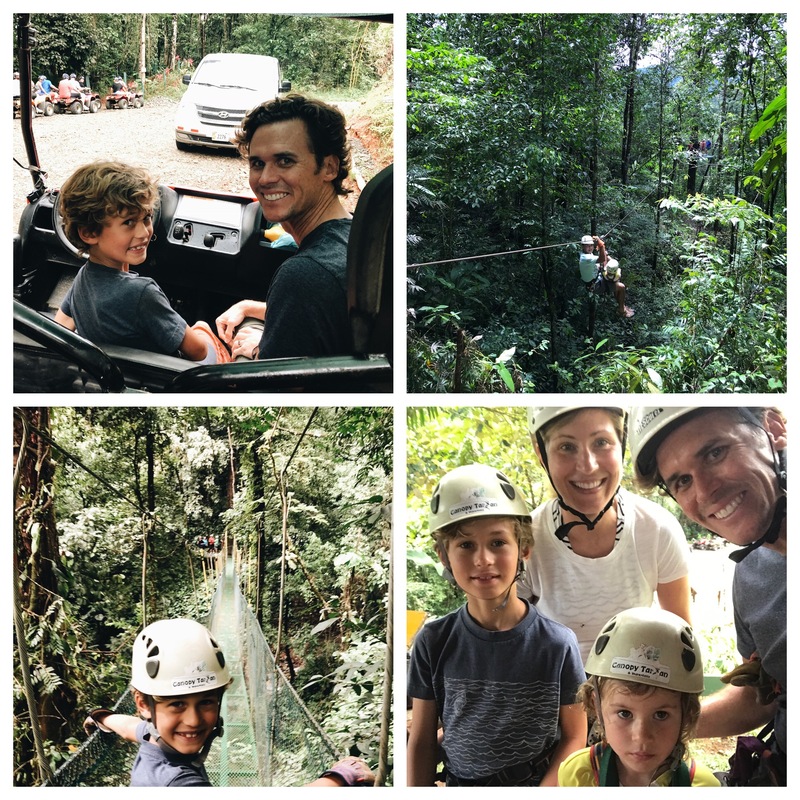 The guides were funny and so fantastic with my kids — especially our five year old who had a guide take her on all the ziplines. She was scared but they put her at ease and she loved it. (See frightened look in lower photo lol) — one fun thing they offered was to “Superman” the longest line. Instead of leaning back they reharness you so you fly out facing down like a bird. It was amazing. The very last part of the day ends at a waterfall – you get to “free fall” into the waterfall. The braking systems, and their method for harnessing you to trees in between lines made this mama feel safe. The drive in the 4 wheeler back to the bus across the river was NOT safe — but it was so fun our kids now have the best memory ever. 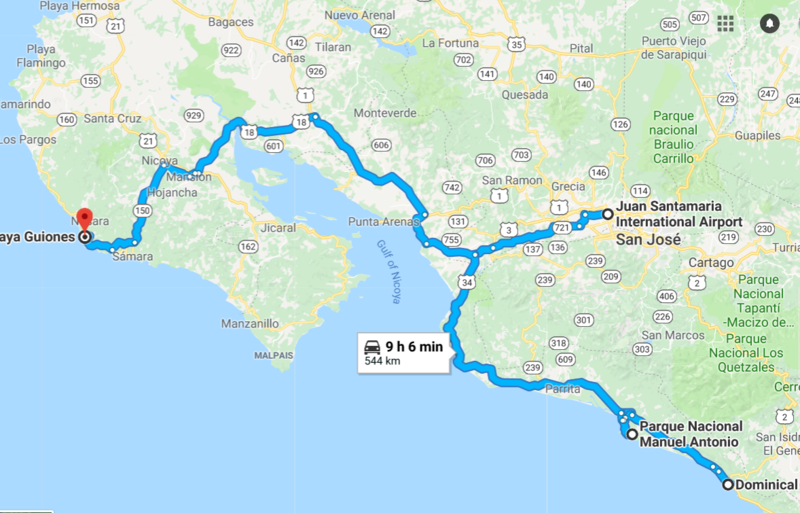 Driving from Manuel Antonio to Playa Guiones was LONG. I think it took us at least six hours, and one of those hours was because a river we needed to cross was washed out and we had to find an alternate route. At least two-to-three hours of the drive was on bumpy potholed roads (so be warned!). As you drive north in Costa Rica it becomes drier. In Guiones, there isn’t as much lush jungle, and unless you stay pretty far outside of town, there are no ocean view places (or restaurants except for La Luna). Playa Guiones is a yogi’s dream. Its filled with ex-pats (which for us wasn’t the best, we kind of wanted a more local/authentic experience) and its been highly built up with restaurants, mansions and yoga studios and retreats. Oddly, the town still has only dirt roads and I hear that in the dry season its very dusty. The great thing about Playa Guiones is definitely the huge beach. The waves are PERFECT for beginners, and my husband said the waves at certain tides were good for an experienced surfer like him as well. We literally spent ALL day here every day we were in Playa Guiones. 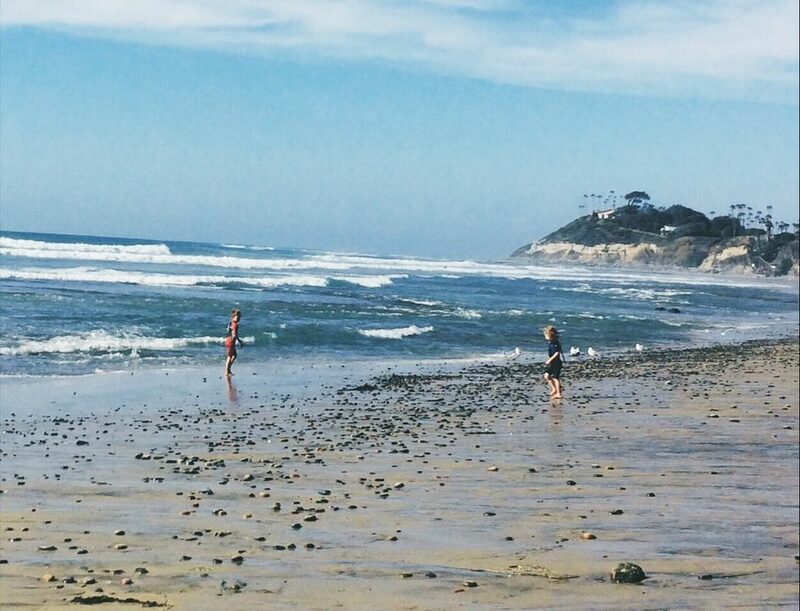 My 7 year old son surfed non-stop and my daughter loved the calm warm waves and played all day. What I didn’t love about Playa Guiones was the aforementioned feeling like I was in the US a lot of the time. Rosies – My five year old still talks about this great little local cafe with Tico plates of chicken rice and beans. She says to me on a regular basis, “Mom, your chicken is pretty good, but Rosie’s is the BEST!” Enough said. Roadside Coconuts – Beat the heat with some fresh coconut water. There are a bunch of little roadside stands where you can get your post-surfing hydration on with a dollar coconut. Super sweet and refreshing. YUM! Il Basilico Italian and Pizza — this is a great pizza spot – the food was good and they have a little playground area for kids which makes it nice for parents to have a little time for a glass of wine and a beer! La Luna – Saved the best for last! This is seriously one of the MOST AMAZING restaurants. The outdoor seating is so romantic and the sunset was spectacular. Not to mention the food — so good. We had some Mediterranean plates with chicken and hummus, salads and fish. It was the perfect way to close out our trip to Costa Rica. 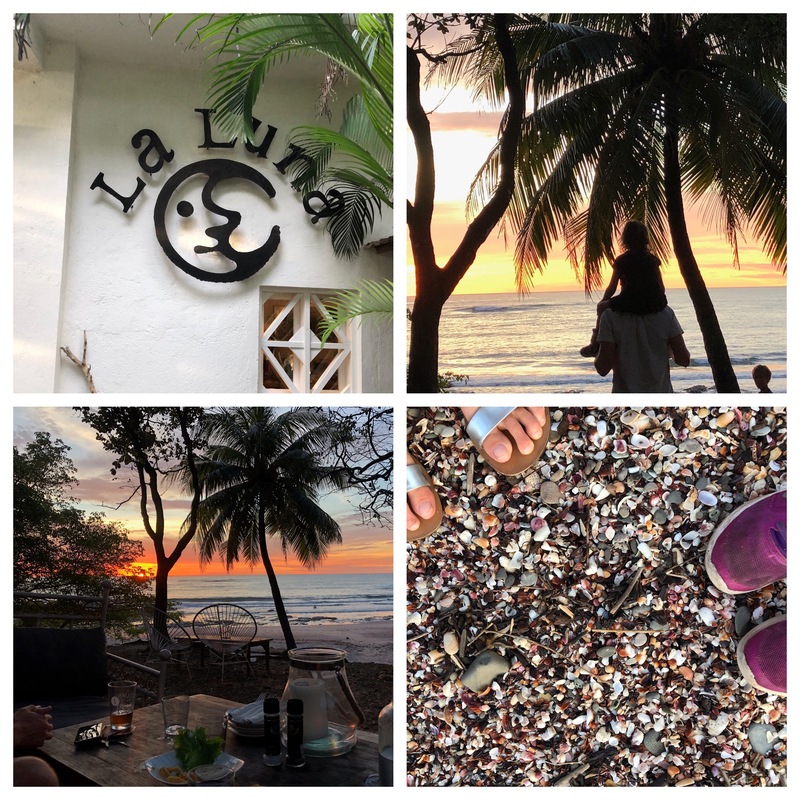 La Luna makes a stay at Playa Guiones worth it. The little beach down from the restaurant has the prettiest shells (see photo below) and at low tide the rocks created tide pools. Have you been to Costa Rica? 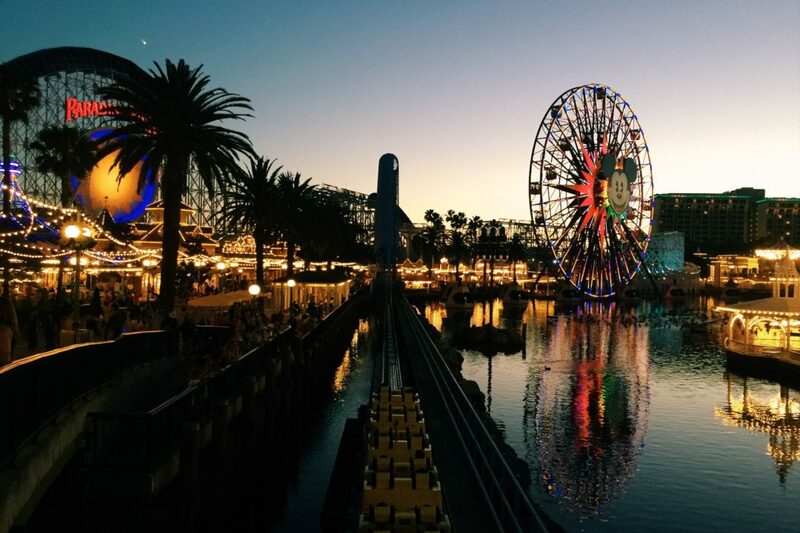 What are your favorite spots? I would love to hear about your adventures in this amazing country. Comment below!